Congratulations to Mel Tainui, who has been selected as a representative to the First Nations’ Futures Programme – a programme that provides aspiring Ngāi Tahu leaders access to leading international research and thinking within a uniquely indigenous context. The programme gives participants a deep knowledge of indigenous economies, science and environmental management. This is a fantastic opportunity for Mel to build on her already impressive knowledge of Maori history, including the Treaty of Waitangi, which she is often speaks about with groups visiting Ōnuku Marae. Ōnuku is one of only three places in the South Island where the treaty was signed, and Mel provides visitors with a deep understanding of the treaty’s significance to future generations of New Zealanders. Mel is an important member of the Ōnuku Rūnanga and marae, as it is her mission in life to work for the betterment of her community and hapū. Mel’s valuable knowledge and experience comes from a variety of different careers and roles from public health promotion, to Historic Places Trust to UNESCO. Alongside her careers has always been her unpaid work in the community, an example of which is organizing the annual ‘Bonjour e Hoa’ Festival in Akaroa. Mel is currently Deputy Chair of the Ōnuku rūnanga, and an alternative representative on Te Rūnanga o Ngāi Tahu. Mel is also currently studying for a Masters in Indigenous Leadership at Canterbury University. Mel is particularly renowned for her knowledge of the Treaty of Waitangi, which she speaks about often here at Ōnuku, providing our guests with valuable knowledge of Maori history. 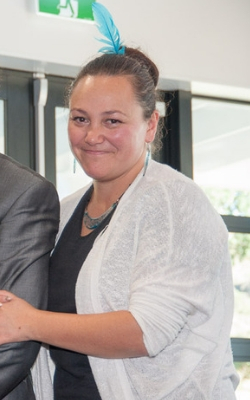 Her current role is with Te Tapuae o Rēhua where she is developing and delivering the Kaea training programme in culturally responsive practice to teachers, leaders and employers. She is also providing training and support to PLD facilitators from partner organisations. Mel is involved in the delivery of the ‘Poipoi Rangatira MoE Pilot project that identifies and develops emerging leaders in communities of learning. This involves running regular marae based wānanga in Otago, Canterbury and Wellington.